United Nations Secretary-General António Guterres has called for a prompt, effective and transparent investigation into recent airstrikes on civilians in Yemen, which claimed at least 50 lives, including children, and injured many others. In a statement attributable to his spokesperson, Mr. Guterres reminded all parties of their obligations under international humanitarian law concerning the protection of civilians and civilian infrastructure during armed conflicts. One of these airstrikes hit a wedding party in Hajjah, north-western Yemen, late Sunday. In another tragic incident over the weekend, civilian vehicles were hit in Taizz, located in the south-west. Ongoing conflict in Yemen between international coalition forces supporting President Abdrabbuh Mansur Hadi on one side, and Houthi militias and allied units of the armed forces on the other has taken take an enormous toll on the civilian population, exacerbating existing vulnerabilities. Across the war-torn country, more than 22 million people – over three-fourths of the population – remain dependent on humanitarian aid. A staggering 8.4 million among them do not know how they will obtain their next meal. 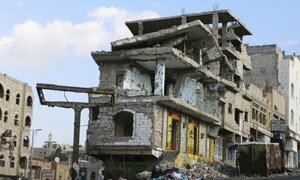 The United Nations Secretary-General has condemned Sunday’s killing of a senior staff member working for the International Committee of the Red Cross (ICRC) in Yemen, who was attacked while travelling in a vehicle on the outskirts of Taiz.